Are you adequately prepared to rock? Click here to play! Do you have the music in you? If so, get out and start a band, the music business could use some talented souls. 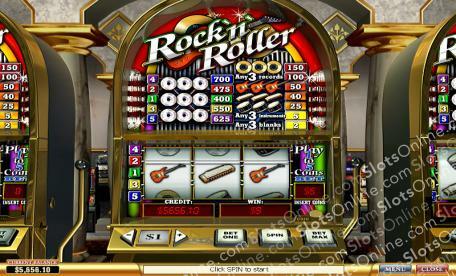 If you more just dream of starting a rock and roll band, then you may get more out of playing the Rock N Roller slots. Collect instruments, gold records and platinum records to create the most legendary band of all time. Every modern band needs someone on guitar, but your band is going to up the ante with three guitars. Your songs with have a melody, a bass line, and an awesome line. Drums are also necessary, apparently, so if the people want drums, your band is going to give them drums. Three drum sets! Beat that every other rock band in existence. Also, who doesn't like harmonicas? Your band will have, take a guess, three of them. Harmonicas are bomb. The music isn't everything for the true Rock N Roller, though. No, you also want to make fat bank, which is where records come in. Release three records of any kind, and you'll start to see the big bucks rolling in. Release three gold records, and mega stardom is within reach. When you have three platinum records in a row, go look in a mirror - you'll be looking at a veritable rock god or goddess, pending your situation. Rock and roll fame is only a few spins away. Get the band back together and become the greatest Rock N Roller to ever pick up the mic.